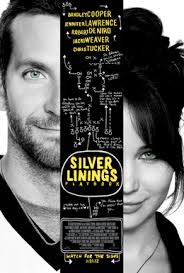 Silver Linings Playbook (2012) Rated R | What to Watch. After a stint in a mental institution, a former teacher moves in with his parents and tries to reconcile with his ex-wife, all while meeting a new girl who sees him for who he really is. Starring Bradley Cooper, Jennifer Lawrence, Robert De Niro, Julia Stiles. Smart, quirky, and thoughtful, this film has become one of my favorite romances. I loved it. Sparks fly as Pat, the bi-polar teacher with anger issues connects with Tiffany, a mysterious, grieving young woman, who attempts to help Pat reunite with his estranged wife. Theirs is a complicated friendship, wrought with mental and emotional intensity. I love Pat’s perspective that you have to look for the silver linings in life. Life does give you lemons, and it is up to you to make lemonade out of them. I found myself completely lost in the story and able to relate to the characters, even with all of their unusual tendencies. This movie is worth a watch. This entry was posted in 2012, comedy, Drama, films, Movie reviews, movies, Rated R, reviews, Romance and tagged anger, bradley cooper, characters, ex-wife, favorite, film, film reviews, films, girl, grief, issues, Jennifer Lawrence, Julia Stiles, lemonade, lemons, life, mental institution, movie, movie reviews, movies, parents, reconcile, Robert De Niro, romances, silver linings, silver linings playbook, stories, teacher, trailer, worth. Bookmark the permalink. Pingback: Top Ten Best of 2013 Films | What to Watch. Pingback: Julia Stiles | What to Watch. Pingback: Jennifer Lawrence | What to Watch.